Facebook users, get in on topical conversation as it relates to The Bahamas on our Group Facebook page, "Bahamas News and Events (BNE)." The fact that our news team is international, we were able to update the BNE Facebook page during the storm, while the power was out in The Bahamas. This was critical to those in The Bahamas clinging to their cell phones for information, as well as for worried family / friends living abroad who were surfing social media for any updates. 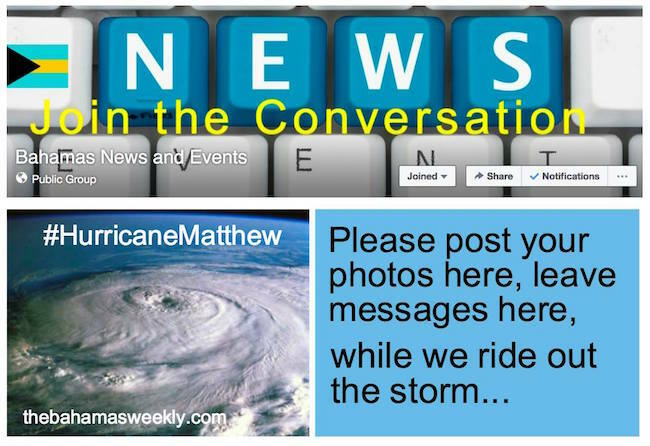 As the hurricane moved through the Bahamas the "Bahamas News and Events" page became a key portal for people sharing their experiences, and even putting out emergency information and calls for help. Matthew has gone, but within hours people were in even more need for information on property, friends and family that may have been affected, in particular in Grand Bahama. Now, days and even weeks after Matthew, the page is still being used to disseminate, share and discuss key information on relief efforts. - For people like myself and my husband who had until a year ago been residents of Freeport for 25 years and for my husband an employee there...your posts were a lifeline to enable us to try to envisage what was happening. We went through Francis and Jeanne and were made homeless ...good friends took us in then and shared their home with us. We feel for the devastation and damage which impacts everyone. - You have helped me deal with so much hurricane Matthew related worry, stress and pain with the information you have provided through this page. Until I found B N&E page I felt LOST and STARVED for information!! I was not sleeping, not eating and basically making myself crazy with worry so please...THANK YOU FROM THE BOTTOM OF MY HEART!! - You were a beacon of light to those who had none. A job well done. The page's search engine allows people to put in key words, like names or islands or apartments to fine important information. Feel free to join the group page - see the link below. A place to discuss the issues and stories of the day...and now helping you find information about your property, family or friends.